Drivers in the Tampa Bay area can now relax and take five – literally – with the opening of two new Take 5 Oil Change location in that market. Take 5 Oil Change is the nation’s growing leader in fast minor maintenance services. Not only does Take 5 Oil Change deliver the fastest pit crew service in the industry, drivers can wait in the comfort of their car and enjoy a complimentary bottled water during their service. 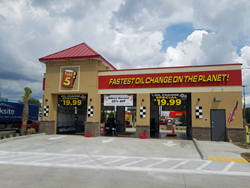 Take 5 Oil Change https://www.take5oilchange.com/ has expanded in Brandon, FL and St. Petersburg, FL with two new locations; one location at 105 W. Brandon Hwy, Brandon, FL 33511 and another location at 1698 34th St. N, St. Petersburg, FL 33713. Take 5 Oil Change boasts drive-through oil changes that take an average of 8 minutes, you stay in your car and we give you a complimentary beverage. Take 5 Oil Change has been serving customers for more than 30 years. In 1996, Take 5 designed the first "5 Minute Drive-Thru Oil Change" location. Take 5 Oil Change is the market leader in speed and quality, and is the fastest growing quick lube chain in the country. Take 5 Oil Change was acquired by Driven Brands in 2016, and today has more than 250 company-owned locations across the United States. For more information, visit http://www.take5oilchange.com. Driven Brands, headquartered in Charlotte, NC, is the parent company of North America’s leading automotive aftermarket brands across four distinct verticals: Repair & Maintenance, housing Meineke Car Care Centers®; Paint & Collision, housing Maaco® and CARSTAR North America®; Distribution, housing 1-800-Radiator & A/C®; and Quick Lube, housing Take 5 Oil Change. Driven Brands has more than 2,500 centers across North America, and combined, all businesses generate more than $2.3 billion in system sales. For more information, visit http://www.DrivenBrands.com.